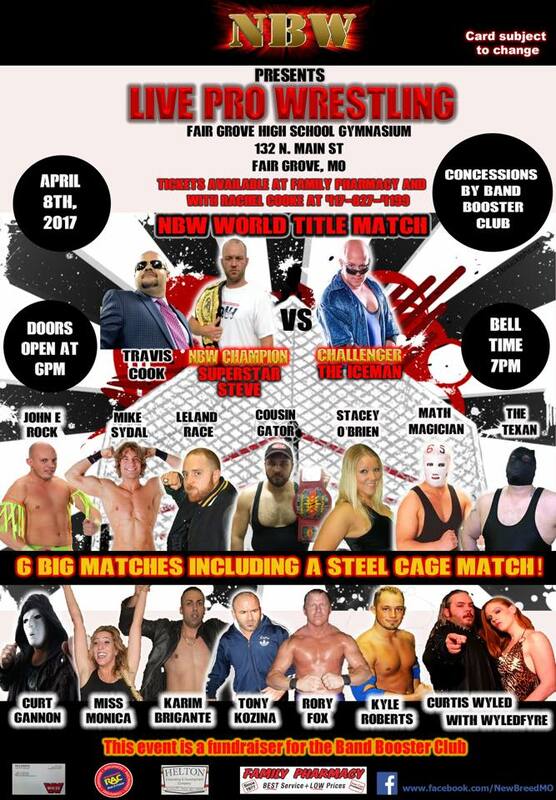 New Breed wrestling will invade Fair Grove High School on Saturday April 8th at 7:00 pm (Doors Open at 6pm). Please join us at 1321 N. Main Street in Fair Grove MO for 7 big matches as we work together with the to raise funds to support the Fair Grove High School Band Department and students. Matches booked for this event include: The New NBW champion Iceman taking on Superstar Steve with his manager Travis Cook in his corner , Rory Fox taking on Leland Race, Stacey O’Brien challenging Miss Monica who is one half of the Roman Dynasty and the 2016 Missouri Wrestling Revival Female wrestler of the year. The main event will be Cousin Gator against The Math Magician in a steel cage match. With The Band Director Corey Lile as the Special Guest Referee. During the event a 60 inch Vizio Smart-TV, donated by Rent-A-Center, will be raffled off. Raffle tickets available for $1 each or 6 for $5 with proceeds going to the meet the needs of the Fair Grove High School Band, including provisions of food at band competitions, purchase and repair of band equipment, assistance in funding students for band trips, and recognition of students in the band. Doors open at 6pm and bell time is 7pm. Ticket prices are $12 for ringside and $10 general admission (kids 5 and under are free)Tickets can be purchased at Family Pharmacy in Fair Grove or by contacting Rachel Cook at 417-827-4199..
For more information on New Breed Wrestling check us out on Facebook at New Breed MO. This entry was posted on April 5, 2017 at 6:32 pm	and is filed under Uncategorized. You can follow any responses to this entry through the RSS 2.0 feed. You can leave a response, or trackback from your own site.